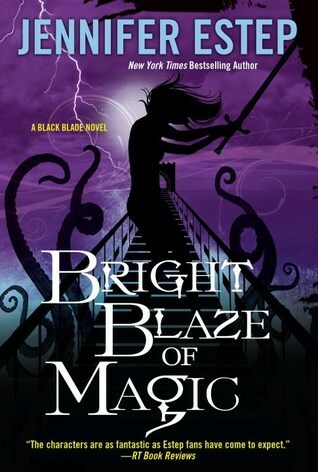 I really loved this series, and the final installment, Bright Blaze of Magic did not disappoint. Estep really delivered with the character development, action-packed plot, and emotional moments. Everything I loved about the first two books was present in this novel as well. Lila was a terrific narrator, and the ending tied things up very nicely. This was an excellent end to the series. Lila grew so much in this final installment, and I was so proud of her. Yea, I know she's not real, but I felt like a proud mother with all of the accomplishments she made. She's one of those characters you can't help but root for, and she just grew up a lot. I felt like we got to see a different side of Devon in this book, too, and I enjoyed getting to know him better. Learning more about Serena and Seleste's past was very interesting as well, and I absolutely adored Deah in this installment. She was so strong. The pacing for the book was a bit slow for me. Yes, there was a lot of action, but there wasn't really a big reveal or plot twist. Sure, I was worried about who would win battles and whatever, but past that, there wasn't a lot going on to make me have a feeling of suspense. I was kept interested because the characters were evolving so much, and there was a lot of stuff going on. However, I just didn't feel a sense of urgency in this book. The writing was well done. Estep is great with descriptions, and she painted wonderful pictures of the scenery in Cloudburst Falls. The ending was perfect, and I couldn't be happier with it. Overall, I'd recommend this book and series to anyone who is looking for a good Urban Fantasy YA novel with some real emotions behind it. The characters are easy to connect to, and Estep's ideas of Talents and a tourist town filled with actual magical beings is too intriguing to pass up. HAPPILY EVER AFTER Blog Tour! Don't Forget to Stop By Capstone's Booth Today! THE NEVERLAND WARS Book Blitz! NO ONE DIES IN THE GARDEN OF SYN Book Blitz! KINGDOM FROM ASHES Book Blitz! Disney Group's Amazing Events at BEA! Chronicle Book Events at BEA! Cornell Lab Publishing Group Takes Flight at BEA!